West Bengal govt. invites Manabik Prakalpa Scheme application forms to provide Rs. 1,000 as monthly pension to persons with disabilities (PWDs). 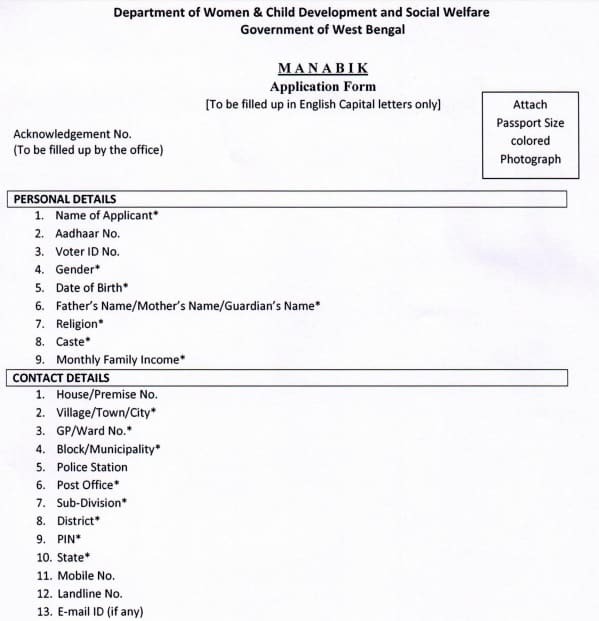 People can download the WB Manabik Scheme Form PDF at birbhum.gov.in to apply online for handicapped pension scheme in West Bengal. Manobik scheme was launched in 2018 for disabled persons to benefit around 2 lakh differently abled people. On the occasion of International Day of Persons with Disabilities, CM has announced that handicap persons with more than 40% disability can avail this monthly pension of Rs. 1000. The state govt. has allocated a sum of Rs. 250 crore for the successful implementation of Manabik Prakalpa Scheme. People can check the guidelines in the Manabik Scheme PDF and can also download the application form which may be submitted to the concerned authorities to get entitled to monthly pension benefits. Here people can fill all the necessary details including personal details, contact details, disability details and bank account details accurately in the downloaded Manabik Scheme Form. Candidates can also submit the complete application form to the concerned authorities to avail monthly pension benefits. Candidates can also visit the official website birbhum.gov.in to get more details about the Manabik Prakalpa Scheme.